Bohemian Switzerland (Czech: ÄeskÃ© Å vÃ½carsko; German: BÃ¶hmische Schweiz), also known as Czech Switzerland, is a picturesque region in the north-western Czech Republic. It lies on the Czech side of the Elbe Sandstone Mountains north of DÄÄÃ­n on both sides of the Elbe River. It extends eastward into the Lusatian Mountains and westward into the Ore Mountains. Its highest elevation is the mountain DÄÄÃ­nskÃ½ SnÄÅ¾nÃ­k at 726m above sea level. It has been a protected area (as ChKO Labske Piskovce) since 1972. The region along the right side of the Elbe became a national park on January 1, 2000, the ÄeskÃ© Å vÃ½carsko National Park. The National Park is adjacent to the Saxon Switzerland National Park (SÃ¤chsische Schweiz) in Germany. 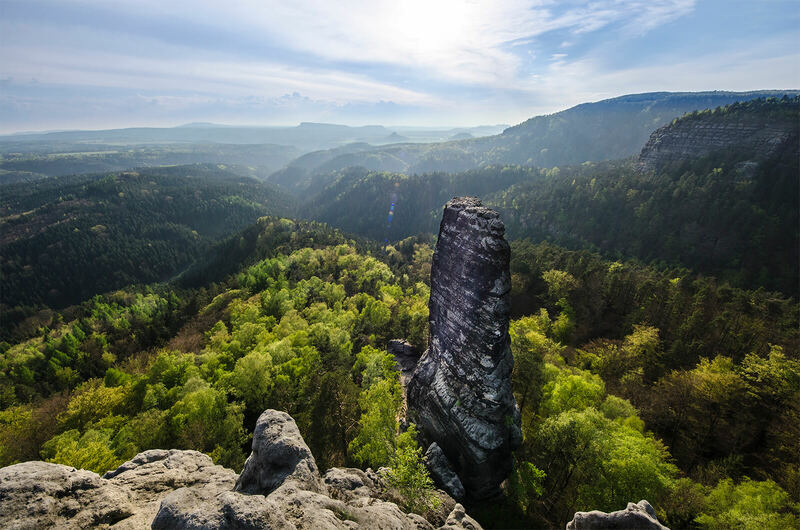 The concept of Bohemian Switzerland developed in the 18th century as an extension of the Saxon Switzerland, the part of the Elbe Sandstone Mountains in Germany. The name was inspired by the Swiss artists Adrian Zingg and Anton Graff, who were reminded of their homeland by the geography of northern Bohemia.